The other day I came across an email written by a Japanese lady who lives in Australia. I had been watching the news and was saddened about the tsunami and earthquakes that have hit Japan but nothing was quite as moving as the letter I had read. I thought instead of summarizing the letter, I would share parts of it with you instead – in the hopes you will be as persuaded as I was to help. You know what’s happening in Japan. It’s just so horrible.. My family is down south in Hiroshima so they are OK but still….I can’t believe what’s happening to my own country. I am very emotional. Unfortunately not everything is broadcasted out of Japan. But please do not misunderstand. They say they have got enough food etc. within the country but the power plants are not operating, roads are blocked, ports and airports are broken too so they simply can’t reach the affected area. People can’t wash their face, brush their teeth, or even simply wash hands. They can’t even have a rice ball for each meal and the other day I saw a family on TV collecting water from the river to use it for cooking. People who are looking for their loved ones can’t do so because they do not have petrol. Huge amount of food etc is stopped just so close to the affected area because the vehicles have run out of petrol. It’s awful! Here’s another way to help… A group of us bloggers are having an auction and all proceeds will go to Japan’s Relief Efforts. 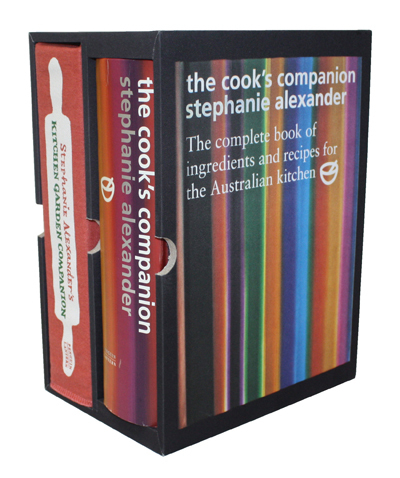 The three icons of Australian cooking, Margaret Fulton, Stephanie Alexander and Maggie Beer – have generously donated autographed copies of their cookbooks to be auctioned off. This is a great opportunity to get your hands on these wonderful books and help at the same time. I am hoping you will support our efforts. Below is a list of what’s up for auction from me (and below is a list of what other bloggers have generously donated). I will ship for free anywhere in Australia. The auction ends 10 April so be quick… Please help me to spread the word – let all your family and friends know, tweet this post, facebook it, and share this post and let’s make this a great success! The Cook’s Companion has established itself as the kitchen ‘bible’ in over 300 000 homes since it was first published in 1996. Stephanie Alexander has added over 300 new recipes as well as 12 new chapters to this thoroughly revised and updated edition. Stephanie believes that good food is essential to living well: her book is for everyone, every day. The book offers invaluable information about ingredients, cooking techniques and kitchen equipment, along with inspiration, advice and encouragement and close to 1000 failsafe recipes. If you have ever dreamed of picking fresh salad leaves for the evening meal, gathering vine-ripened tomatoes or pulling up your own sweet carrots, Kitchen Garden Companion is the book for you. Follow in the footsteps of one of Australia’s best-loved cooks and food writers as she reveals the secrets of rewarding kitchen gardening. Be encouraged by detailed gardening notes that explain how adults and children alike can plant, grow and harvest 73 different vegetables, herbs and fruit, and try some of the 250 recipes that will transform your fresh produce into delicious meals. Whether you have a large plot in a suburban backyard or a few pots on a balcony, you will find everything you need to get started in this inspiring and eminently useful garden-to-table guide. Maggie Beer is one of Australia’s best-known food personalities. As well as appearing as co-host of the weekly program The Cook and the Chef on ABC TV and writing books, Maggie devotes her time to her export kitchen in the Barossa Valley, which produces a wide range of pantry items for domestic and international markets. 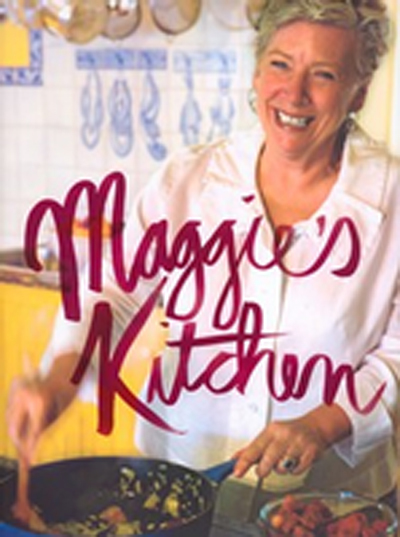 Maggie was also recognised as Senior Australian of the year in 2010 for inspiring joy to many Australians through food. From Maggie’s own kitchen come 120 favourite recipes she has shared with her television audience, as well as the everyday basics Maggie believes form the foundations of a good food life. 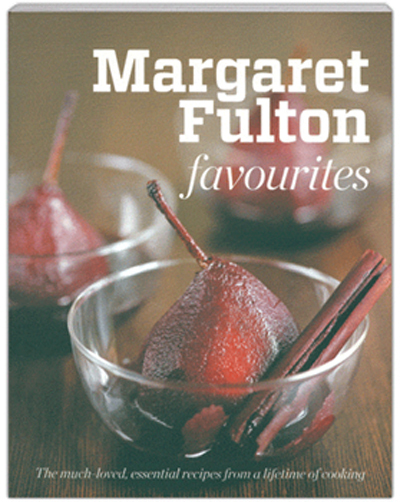 The woman who taught Australia to cook, Margaret Fulton, brings together her favourite “everyday cooking” dishes for you to create and enjoy. This stunningly-illustrated book is a delight to read, with each triple-tested recipe introduced by the kitchen queen herself. You won’t be able to resist dishes like French Roast Chicken Dinner and Self-Saucing Chocolate Pudding. There are plenty of tips too. A special thank you to Hill of Content Bookshop for kindly donating this cookbook. In a land far away, the tremors have yet to subside, the Earth has still not stopping shaking and continues to heave ever so often. Yet, the people from the Land of the Rising Sun, have already started picking up the pieces and putting them together, displaying enormous courage in the face of despair to reach out and help others even when they have little themselves. This display of true spirit and common bond cannot but fail to inspire and move us. In an effort to lend a helping hand (humble as it may be) and in support of the perseverance of human spirit, a small group of international food bloggers have come together to put their passion for food to a charitable cause. The International Food Bloggers Auction for Japan is a contributive effort from these bloggers to raise funds for the Japanese Red Cross Society towards their disaster relief efforts. Each blogger has pledged an item that will be auctioned to be sold to the highest bidder. Details of the pledges are included below. The auction will run live from March 23, 2011 to April 10, 2011, during which period, readers may bid on as many items as they wish. Once the auction closes and the highest bidder is identified, the person will receive the item that he/she bid for and the bid amount will be donated to Japanese Red Cross in entirety. * Liren of Kitchen Confidante – Afternoon Tea Basket, inspired by my husband’s family who spent 5 years in Japan. It will have a freshly baked loaf of our family’s Buttermilk Banana Bread, a tin of Samovar Green Tea, and a variety of sweets and local goodies from the Bay Area. 1. Auction Period: March 23, 2011 to April 10, 2011. 2. The auction is open to all readers across the globe. Availability of items is as indicated in the Auction Bid Form. 3. Bid entries are to be made using the Auction Bid Form. 4. Bidding can be for one or more items. Multiple bids from the same bidder will be accepted and highest bid will be taken into account. Minimum and High bids for each item will be made available at the end of each day. 5. Auction closes at 12pm EST, April 10, 2011. Highest bidders and bid amounts will be revealed in a post by April 12, 2011. 6. The winners will be asked to transfer the pledged amount through PayPal, which, will then be donated to the Japanese Red Cross Society via Google Crisis Response. 7. Winners will receive their items within two weeks of the reveal post announcing the winners. What a good cause! There are many good people trying to help out via auctions and on-line bake sales … it is so important to all pitch in on helping our Asian neighbors. Thanks, trissa for your continued attention to this catastrophe. Wow what a heart-wrenching plea. I’ve already donated what I can afford elsewhere, but I support and applaud any and every effort to help Japan in this terrible time of desperate need. Thanks for participating in and sharing this! Good project! We already donated $100. through Red Cross. Hello. Thenk you so much for putting my msg on your blog and spreading my plea to more people! I really don’t know how to thank you all who are involved here. I really appreciate your warmest support. Glad you got my msg through our mutual friend.